Our push-on style valve cover breathers contain an effective filter which traps oil vapor and prevents engine compartment contamination. Inscribed breathers come with rubber grommets and match our chrome valve covers. Fits any 1-1/4” diameter valve cover hole. 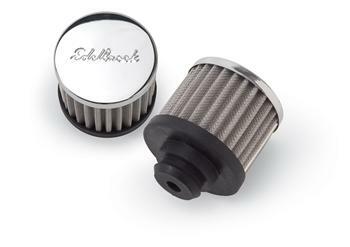 Elite Series breathers are die-cast aluminum with a foam element. 3 styles are available: #4201 & #4211 bolt to the side, #4202 and #4212 bolt in the oil fill hole and #4204 and #4214 simply push into the oil fill hole. Breathers #4202 and #4212 will not fit Elite Series valve covers #4246, #4247 or #4248. These push-in style valve cover breathers contain a foam filter element which allows the engine to properly breathe and traps oil vapor and prevents engine compartment contamination. Available polished or with a black powder coated finish to match Edelbrock valve covers. Fits any 1-1/4” diameter valve cover hole. A sand cast aluminum breather for competition use. The smooth, polished top with distinctive Edelbrock script matches our 4100 series racing valve covers.